There are three lights guiding ships in and out of Duluth Harbor. The lights on the south breakwater were built in 1901, and the light on the north breakwater in 1910. 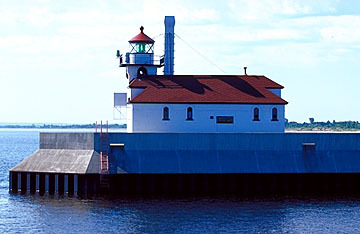 The inner south breakwater light sits under the drawbridge. This steel frame tower is 67 feet tall, with a Fourth Order Fresnel lens. 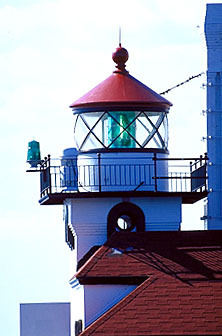 The south breakwater outer light still has it's green Fourth Order Fresnel. 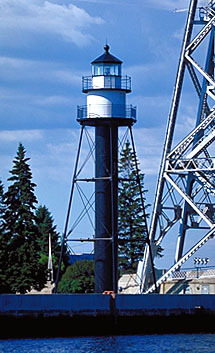 The north breakwater light is a 37 foot cast iron tower with a Fifth Order lens. The city of Duluth is sparkling and pretty, perched on a hill above Lake Superior's western edge. The waterfront area is alive with shops, hotels, and restaurants. It's a very nice place to visit.